Waterproof, shockproof, and freeze-proof, the Nikon 10mm f2.8 AW 1 Nikkor wide-angle lens is not afraid of the elements and can take a bump or two. With its robust build and luxurious metallic exterior, it complements the Nikon 1 AW1 camera perfectly. 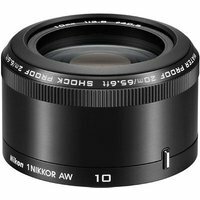 The 10 mm focal length is ideal for close-ups and sweeping vistas. The fast maximum aperture of f/2.8 means sharp shots of low-light moments, which is especially handy when shooting in murky underwater environments.